This week I have the opportunity to lead the discussion at our Business Minds Group. I will be leading a discussion around one of the best books I have read in 2016. The book is entitled, Culture Trumps Everything, by Gustavo R. Grodnitzky, Ph.D. Hiring vs. Onboarding, Which is More Important? I hope you realized that this is a trick question. Great leaders will spend about half of their time on these two important key competencies. My focus on excellence in these two areas has been one of the keys to my success as a manager. In In the future, I will write articles that will focus on best practices for hiring great employees, but this article will focus on how to make sure your employees are productive in the first six months. Tomorrow we will have the opportunity to talk about Xgility core value #2. 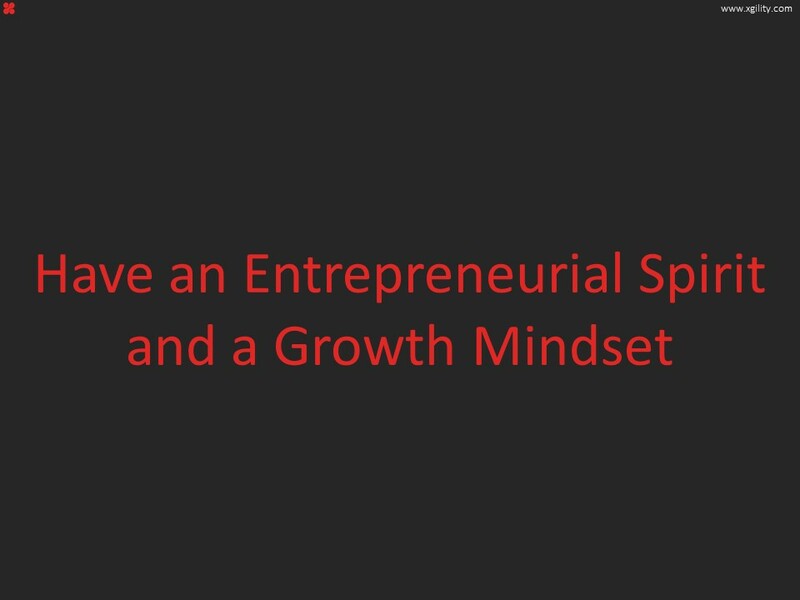 I don't believe you need to take as much risk as an entrepreneur in order to have an entrepreneurial spirit and a growth mindset. I believe in the Google corporate practice of every employee taking a portion of their time to experiment with new ideas. In terms of having and entrepreneurial spirit there are 7 ideas I want to communicate to our team in order to help us live this value. Listen to, support, and improve the best ideas of your peers. Ask your customers about their challenges in order to generate innovative ideas. Use the saying "that is not my job", sparingly. Don't punish failures or bad ideas. Share your good ideas in the weekly status report. Your best ideas should turn into repeatable intellectual property in our Center of Excellence intranet site. In terms of having is growth mindset, it is important to remember that what got you here won't get you where you want to be 1 or 10 years from now. You need to invest, likely after hours, in your professional growth. Henry Ford said, "Anyone who stops learning is old, whether at twenty or eighty. Anyone who keeps learning stays young.," Alan Weis did the math that shows if you "Improve by 1% a day, and in just 70 days, you’re twice as good." We are blessed to live in a great county where free opportunities for growth abound including the internet, public library and user groups.